“What is the reason for attacking an innocent this time?” inquired a gentle voice. Although gentle, it somehow echoed through the large chamber. The Faerie she was speaking to flipped her purple and green hair indignantly, trying her hardest not to look like a petulant child. Jhudora gaped at the Queen. Fyora had always been patient and understanding. It was true, Jhudora did bring up Illusen quite often, but every time Fyora had let her finish. Sure, she had put her down and called her insane, but she had never gone quite that far. She had never interrupted her mid-sentence. She had never complained. Jhudora nodded and walked out of the castle without saying a word. She flew over to Meridell and found Illusen. Illusen sighed and got up from her relaxed position on the ground. She fluttered her sickeningly beautiful wings, wings shaped like the leaves on the trees around her. She flew gracefully into the air, followed by a more awkwardly flying Jhudora. Her bat wings never really allowed her to fly elegantly. They reached the castle and Illusen bowed before Fyora. “What is it that you want from me, my Queen?” she asked. Jhudora had to stop herself from snorting. Illusen always acted pleasant and polite amongst others, while showing her true self only to Jhudora. “Illusen, tell me if this creature is familiar to you,” the Queen requested. Illusen looked up. 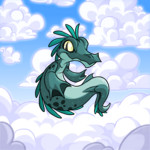 Fyora took out a white Weewoo, the very one that flew into Jhudora’s tower earlier. ‘Only ten years?’ thought Jhudora. In a Faerie’s point of few, a year is not that long. Seeing as they live forever, a year seems like months, weeks, days, hours. In the long run, a simple year, or ten, will not make a difference in a Faerie’s life. Until now. Now, she received the chance to tell the world the truth about Illusen. Now, the world can see Illusen for what she really is. A liar... A cheater... A Dark Faerie. Illusen started muttering to herself as soon as she was out of earshot of the palace. How could the Queen do this to her? How could she possibly listen to anything that wicked Jhudora said? After all, it was clear that Illusen was the superior sister. All her life, she had strived to out-do Jhudora. Even her parents knew that Illusen was the better daughter. And now she was being forced to argue her side. She smiled. Ten years came and went. Both Jhudora and Illusen stopped their quests and all other things they did before their searches began. Neopia was in a craze. Everyone knew that something big was about to happen in Faerieland. They didn’t know what, but they knew that when it did, Faerieland and Neopia were going to be changed forever. They arrived at the castle gates at the same time. Illusen created vines around Jhudora and whisked into the palace. Jhudora angrily ripped the vines apart and stalked in after her sister. Illusen was just getting up from her bow when Jhudora walked in. Illusen smirked at her and spoke to Fyora. “I see my sister has finally arrived,” Illusen said with a sneer that only Jhudora could see. The sisters, or twins, rather, sat down in the chairs before the Faerie Queen and set their evidence down on the ground. The Earth Faerie opened her bag and brought out scrolls aged with time. She handed them to her Queen and began her story. “Only through cheating!” Jhudora cried out. Jhudora glowered but said nothing. Most don’t know this, but Faeries are not born one way or the other. All young Faeries have no type. When they are near to their coming-of-age time, they visit the Space Faerie. She reads the stars and planet alignments to determine which kind of Faerie they will grow to become. Although she is not always correct, her guesses are right most of the time. Many Faeries visit her to plan their futures and know what life is ahead of them. “Being twins, it was more difficult for the Space Faerie to read our futures. She determined that one of us would become a Dark Faerie, the other an Earth Faerie. She told us that what we do will decide which becomes the Dark, and which becomes the Earth. Our actions would decide our entire future. Now, neither of us wanted the future of a Dark Faerie. Living in such solitude didn’t suit either of our personalities. Also, our entire lives had been a contest between each other. So this just became another one. Illusen sat back down in her chair and crossed her legs, confidence oozing out of her. “Queen Fyora, please have the patience to listen to my story. It’s considerably longer than Illusen’s, mostly because it contains the truth and the details of our past. “It is true that our entire life has been a contest. Illusen’s main purpose in life was to defeat me in everything that we do. The only problem was that I was the one beating her. After a while she got tired of it and began to sabotage me. We’d have races and she would coat my wings in a strange substance, making them heavy and hard for me to fly with. There was a beauty pageant in our school and Illusen mixed my makeup with other chemicals, causing my hair to burn and my face to appear gaunt. “Once we were out of school, the competitions ended. We started helping each other and preparing for our lives as real Faeries. We went to see the Space Faerie together when she told us our futures. After that point, our lives became a war. The Earth Faerie snorted at this, but Fyora silenced her with a look. “She would complain about how ‘The little beasts were ruining her hair’ and how if it were up to her, she would ‘throw all those disgusting Mortogs to Turmaculus for his dinner.’ She really hates nature, but no one knows it because all of the lies that she spins. “But while she was spending time outside, I was spending time inside. Yes, I was making potions, but they weren’t for Dark purposes. I actually ended up creating the first Morphing Potion! However, Dr. Sloth managed to get his hands on my rough drafts of the potion, where the Neopets turn to mutants. “I also made fertilizer. I wanted to make the plants in Neopia bloom faster and look better, so I combined various ingredients (I can’t tell you what because that would ruin the secret) and now the plant-life here looks better than ever! “The last thing I made before judgment time was the liquid that Jhuidah uses in her Cooking Pot. She had been trying to find a suitable chemical for years and they all worked, except when used on Petpets. They turned the new Petpets into horrible mutants, worse than what the Transmogrification Potion does to Neopets. She was grateful when I presented the new chemical to her. Fyora nodded and Jhudora went on. “I was delighted with how it turned out. I loved my new self. I looked rather similar to how Illusen looks now, with red-brown hair and a green streak. Illusen looked rather like me, but lacking the green streaks in her hair. “While I was happy, Illusen was furious. She thought her good deeds would cause her to become an Earth Faerie. But her reasons were false. She helped others only for personal gain and hated every minute of it. I helped others because I wanted to. Illusen vowed that day to take my status away from me. And in the end, she did. “Many years passed, and both of us did Quests. Little did I know that Illusen’s items would all go to taking my power away. I used my Quest items to create more potions. More pollinators, some foods (like the Chocolate Eartharole), and various others. I was content with my occupation. Illusen took that all away from me. “We met up later on, in Meridell. She said she was glad that I got the Earth position. I was surprised, but pleased with her acceptance. She offered me a drink in congratulations. Thinking nothing of it, I drank. Nothing happened to me right away. I went to bed that night feeling perfectly fine. The next morning, when I saw my reflection in the mirror, I froze. My hair had turned purple, my eyes a shade lighter than my hair. My wings looked like that of a bat’s. The only thing that remained was my green streak. I had touched it, remembering the days that I was an Earth Faerie. Had it all been a dream? I knew it wasn’t. I was still in my Earth Faerie nightgown. I flew straight to Illusen. “When I found her she was in Meridell, what is known now to be Illusen’s Glade. She looked like me, but without the green streak. She was in the process of dying them into her hair. I asked her what she had done to me and she told me that I foolishly drank the potion that made this abomination occur. She had gestured to the bed, where a Dark Faerie dress lay. ‘That’s yours now,’ she had said. “I went crazy. I tore her house to shreds with my frighteningly sharp nails. The Meridell villagers saw me and drove me from the place, thinking I was attacking an innocent Earth Faerie. She spoke to me before I left. ‘Here,’ she had said, handing me the dress, ‘you’ll need it. Don’t bother giving me your clothes. I’ll find my own.’ I had answered back, ‘You’ll regret this, Illusen. You will never come back to Faerieland again.’ She had paled but retorted, ‘How will you stop me?’ ‘If you do, I will personally make sure that Fyora finds out about this. I’ll tell the world about your treachery. And you can be sure that I will spend every waking moment of my life finding out how to get my power back.’ And with that I had flown away. Jhudora stopped speaking and reached down into a bag. She took out a beautiful Earth Faerie dress, more beautiful than anything Illusen owned. Fyora walked over to Jhudora and gently fingered the dress. There was a crazed look in Illusen’s eyes. She snatched the dress away and ripped it to shreds. Jhudora gasped and started picking up the pieces, more furious with her sister than ever. What do you think Fyora chose to do, reader? Did she pretend she never heard Jhudora’s story and allow them to live as they have? Or did she quietly switch their roles, so that none may know the truth? Her final ruling is unknown. So the question is, is Illusen really Illusen, or is she Jhudora, pretending to be Illusen? Is the Jhudora we all know and hate the real Jhudora, or is she merely Illusen in disguise? The world may never know.